The new highly anticipated Horizon Zero Dawn expansion The Frozen Wilds, will be arriving in just over a week’s time on November 7th, 2017 and to whet your appetite ahead of its arrival Sony have released a new teaser trailer providing a glimpse at the snowy wilderness and its creatures you will encounter. The Frozen Wilds expansion is located in the Cut, a boreal wasteland to the north that separates the Banuk homelands from the rest of the world. – Uncover a compelling new story. – To use this download, you need Horizon Zero Dawn. – Enhanced for PS4™ Pro with dynamic 4K gaming, improved graphics and environments, and High Dynamic Range visuals. It is a place where all but the most skilled hunters dare venture, and those that do must survive against dangerous new machines and freezing temperatures. The latest trailer for The Frozen Wilds highlights some of the environments you will explore in this expansion to the world of Horizon Zero Dawn, including Banuk camps, frozen lakes, icy caves and more. Beyond the northern mountains, the borderlands of the Banuk tribe challenge all who dare enter to survive the extremes. But now this frozen wilderness harbors a new threat, and for Aloy, a new mystery – one she’s determined to solve. 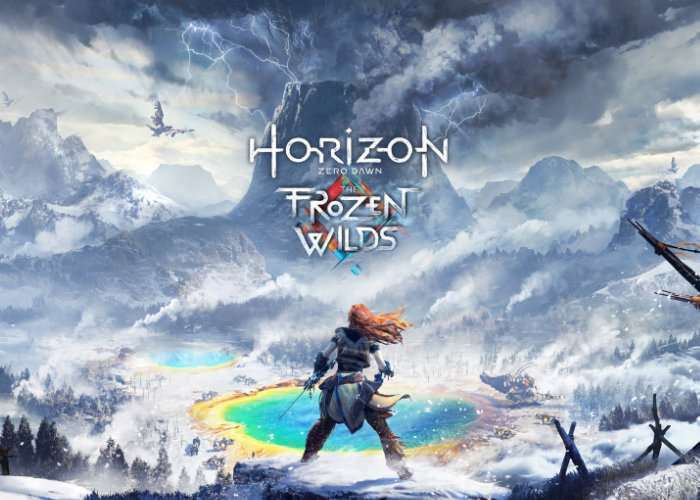 The Frozen Wilds contains additional content for Horizon Zero Dawn, including new storylines, characters and experiences in a beautiful but unforgiving new area.